The edition of the account takes with nothing from his addition. One ought to click on the menu File, and then from him to select the option Send account. From the right windows we choose which account we want to edit across the single click. Then with the menu on left side we choose the button Edit account. The field Name is intended on our account name after which we will be in a position to identify it during the addition of the new mailing. We pass on the tuck Setings. 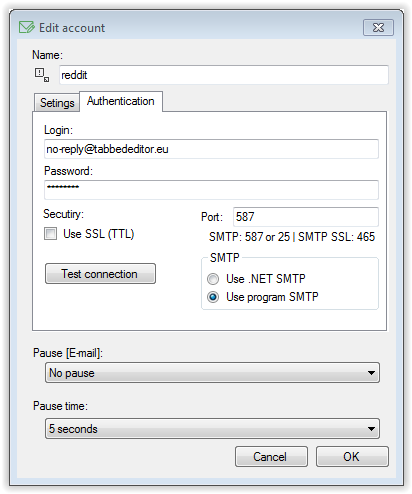 In the field Server one ought to enter the address to the server SMTP. Name of sending messages is intended on the inscription of its name be business names which will appear as the name of the sender in the program of the user. 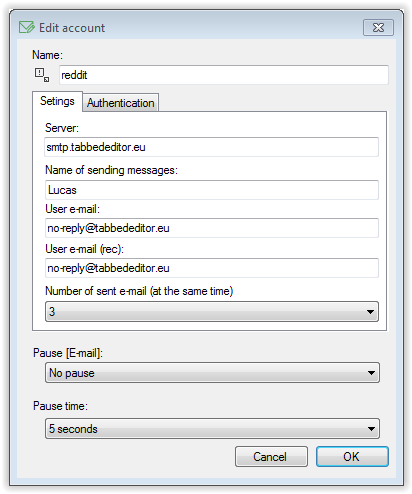 Fields User e-mail and User e-mail (rec) must contain the address the e-mail on the server from which the message becoming sent. First is a sender, and second an address on which is supposed to remain returned message in case of the answer. The next field then Number of sent e-mail (at the same time) serves to defining of how much message the e-mail will be sent at the same time. We pass on the tuck Authentication. The field Login is intended on login to the server SMTP, and the field Password on the password to that server. Then one can use connections SSL/TTL and to define Ports. Because on some computers due to installed antivirus system the part of ports is closed I added two methods of the emission. First Use .NET SMTP uses methods built-in into the programming language, however second Use the program SMTP uses special libraries elaborated by the company Rebex. When we will finish the setting up we click on the button the Test connection. This will cause the test of the connection to the server about what we will be informed in the special communication. Below windows are defined fields Pause which decides how much sent letters the e-mail remaining the added pause in the emission and the field Pause time to which we can define his length. After the end of the configuration we click on the button OK.